2nd ODI India vs Australia: Anushka Sharma used a funny Snapchat filter on husband Virat Kohli after the India skipper slammed his 39th ODI ton to lay the platform for an Indian win. 2nd ODI India vs Australia: Anushka Sharma used a funny Snapchat filter on husband Virat Kohli after the India skipper slammed his 39th ODI ton to lay the platform for an Indian win. India leveled the series with a six-wicket win at Adelaide. Anushka seems to be making the most of Virat’s time in-between matches where she is often seen shopping or getting a selfie clicked. 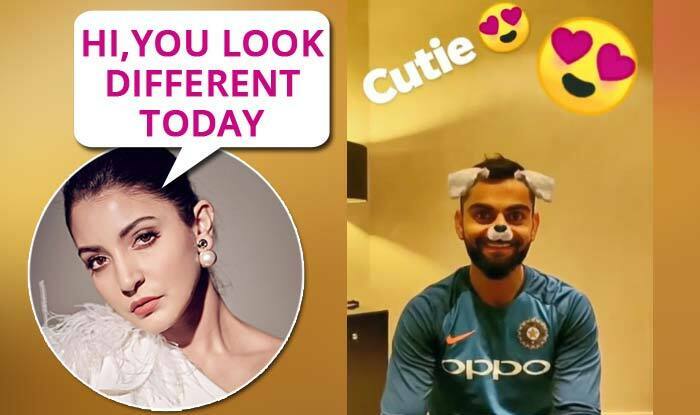 Anushka Sharma and Virat Kohli seemed to have celebrated the win with a funny Snapchat filter where Anushka says, Kohli, that he is looking ‘different’. Earlier in the day, Kohli bagged the Man of the Match for his 39th Test ton that resulted in an Indian victory. But it was former captain MS Dhoni (55*) and Dinesh Karthik’s (25*) 57-run-stand that took India over the line in the last over of the match. Dhoni hit the winning six in his signature style to seal the deal and set up a mouthwatering decider at Melbourne Cricket Ground.